For my last ultra of 2014, I ran (read: power hiked!) the Indian Creek Fifties, a trail race through Roxborough State Park. 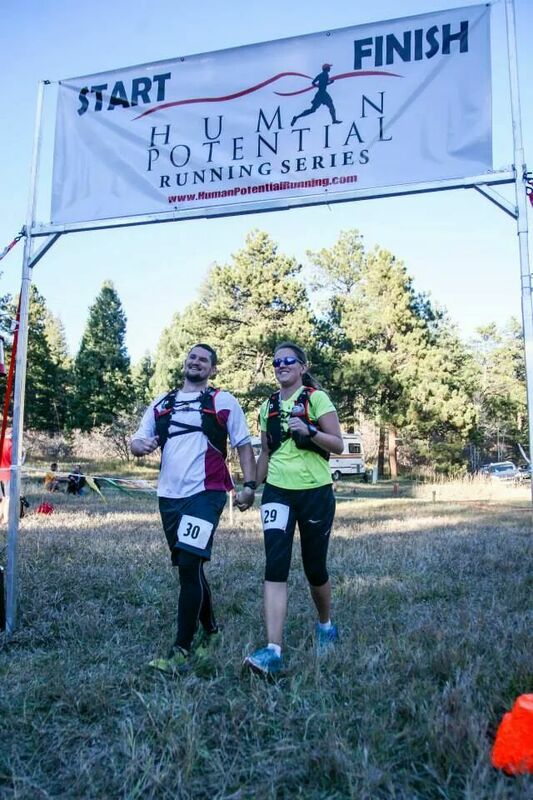 The course has 8,000 feet of climbing, the same amount as the Pikes Peak Marathon, but the gains are broken up into several segments along the rolling trail. This is what I learned (or, rather, re-learned): pain doesn’t last forever. By mile 12 of the 33 mile race the arches of feet were cramping. My lower back ached. My IT band was tight, and my glutes-hamstrings-calves felt like too-tight rubber bands pulling my ankles into my hips. I thought, “If I feel this badly now, how horrible will I feel by mile 31?” I panicked and just about gave up, nearly quitting at the next aid station. Instead of coping with the race one mile at a time, I began to catastrophize how hard the remaining miles would be, imagining my pain levels rising exponentially with each section of the trail. I suspect it is somewhat human nature to catastrophize discomfort in this way, but my chronic pain has conditioned me to have this tendency even more than I otherwise would. Thirteen years ago, at the onset of my headache, I didn’t expect that I would still be in pain today. Eventually, once I realized I was dealing with a chronic condition, I began to fear that any type of pain would lead to the same outcome. I stub my toe or roll an ankle, and a part of me fears the pain of it will last my entire lifetime. But my race-day ails didn’t rise exponentially. By mile 20, I had worked through most of the discomfort and felt stronger. Each problem area – my feet, back, IT band, hamstrings – alternated hurting and feeling relieved. None of it became unmanageable. I finished feeling better than I had at mile 12. My chronic headache doesn’t worsen exponentially either, even though it feels that way sometimes. For past two years, I’ve had more and more bad days of incapacitating pain. Instead of a dull ache that only sometimes because sharp and pounding, it slowly became the other way around. Then, rather suddenly, in August my bad headaches nearly disappeared. I am now back to having a low level chronic ache with only infrequent rises of worsened pain, as long as I take care of myself by resting enough, eating well, and running frequently. (I’m almost afraid of typing this, as if acknowledging the improvement will jinx it. I simultaneously want to bold and enlarge the declaration, as if to shout it.) I have no idea why my bad days nearly vanished; I just know that they did. It’s hard for me to remember those shifts because the headache is, literally, endless. But I do remember her voice reminding me of this hope when I can’t hold it myself. And this race has reminded me in a visceral sense that pain doesn’t last forever. Pain shifts. It isn’t a relentless climb up a towering mountain, but rather a trek on a rolling trail that steeps then flattens, that promises a reprieve after the most grueling bits. Nick and I crossing the Indian Creek Fifties finish together, after I caught up to him mid-race. I loved seeing you and Nick cross the line together. Together is an important word at our house and it’s kept us going for sixty-six years, two months, and eighteen days. But who’s counting? Cancer people have the same reaction when confronted with a new symptom like stubbing my toe. “Oh, no, toe cancer!” Even after all these years, because you can have a recurrence or metastasize of breast cancer years and years later. I have never had to tolerate the level of pain that you do, but I have noted that pain does level-off to a tolerable level. I have run lots of races where I thought I was down for the count, but managed to run through it. With me at least, it is a mind game — my mind wants to wimp-out way before my body is really used up. You are my hero Lynn. One day I hope to see you on the trail (briefly as you pass me by).